The ex-Scotland boss will step down at the end of the season to take a seat on the Pittodrie board. 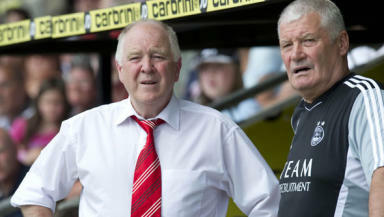 Aberdeen boss Craig Brown has announced his decision to retire from football management at the end of the season. The 72-year-old's contract at Pittodrie was up at the end of the campaign and he has opted to take up a role as a non-executive director on the club’s board. 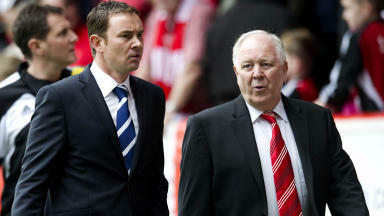 With Aberdeen sitting outside the SPL's top six, current Ross County boss Derek Adams has been linked as a replacement. Brown told Aberdeen’s official website: "Having reflected long and hard on the situation, I felt the time was right for me to step down as manager. "I feel it is important this is out in the public domain as I do not want anything to distract from the playing side over the next few weeks. Archie and I are determined to do whatever we can to help the team finish 2012-13 on a high and we strongly believe we will be leaving a solid base for the next management team to build on." Brown's assistant Archie Knox will leave the club at the end of the current campaign. Aberdeen chairman Stewart Milne added: "Craig and Archie have worked tirelessly to turn the Club around over the last twenty-seven months. "They are very much a team, as everyone is aware, and the contribution they have made in taking the club forward is immense. The staff throughout the club hold them in such high regard and they will certainly be a difficult act to follow. "When Craig indicated that he, would step down I asked him to become a non executive director and I am delighted to say this will take effect immediately. "Craig will have input to all areas of the Club like any other board member and will be a fantastic ambassador for Aberdeen Football Club. He has held a board position at Clyde FC in the past so is well aware of the challenges football faces everywhere as well as here at Aberdeen. As a board member he will play a full role like the rest of the board in choosing his successor. "Archie will always be welcome back at Pittodrie where he has contributed so much over the last couple of years and during that unforgettable period in the 80's along with Sir Alex Ferguson." The club say they will begin the search for Brown's successor immediately.